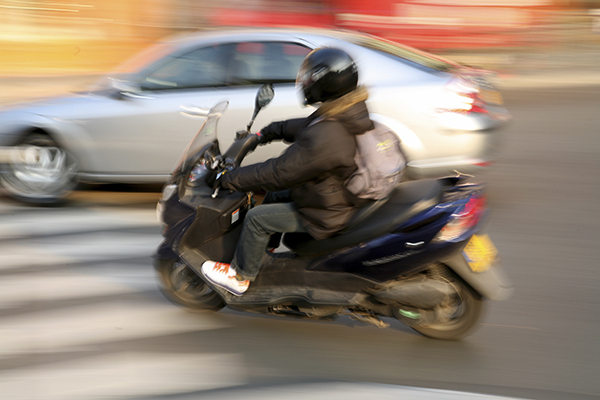 Brain injuries account for more than 60 percent of motorcycle deaths. Wearing a Department of Transportation (DOT) – approved helmet can significantly reduce the risk of brain injury, and even save your life. New Jersey has a mandatory helmet law that requires motorcyclists to wear a protective helmet with either a neck or chin strap that is reflectorized on both sides, while riding. It’s a rider’s best defense against an injury or worse… a fatality. Full-face helmets cover the entire head and most of the face. A clear acrylic visor slides over the view port to block out wind, rain and dust and to ease eye fatigue. These helmets are considered the safest in terms of protection, as they cover the widest area of the head and face. Three quarter shell helmets are similar to full-face helmets, except they do not cover the face. The shell extends from the brow over the cranium to the base of the neck and forward over the ears. These helmets afford much of the same protection as full-face helmets. Half shell helmets cover only the top half of the head. Though they weigh the least, half shell helmets don’t cover the ears, offer the least wind resistance and offer the least protection. Modular helmets are a combination of the open-face motorcycle helmet and the full-face motorcycle helmet. This style helmet permits the wearer to raise the helmet’s chin bar out of the way, allowing the rider to simply remove a barrier without removing their helmet. There are many manufacturers making DOT-approved modular helmets. Learn how and why helmets work… and how to choose the right one for you! The only thing between you and the road is your protective gear! Eye Protection: Make sure you have an approved shield on your helmet or wear a pair of goggles/safety glasses with a Z rating. Keep your shield or glasses clean and scratch-free. Reflective Clothing: Wear reflective clothing and apply reflective stickers or tape to parts of your motorcycle. Hearing Protection: Use disposable foam earplugs or reusable custom-molded devices for noise reduction. Be sure to check your motorcycle before every ride and stay on top of routine maintenance. A modulating headlamp is more visible than a standard lamp. Consider installing auxiliary lighting or running lamps in addition to originally equipped lights. LEDs are becoming more popular over conventional incandescent bulbs and are often found on newer motorcycles. After-market LED bulbs can also be purchased to replace standard bulbs. LEDs last up to 10 times longer than incandescent bulbs, emit 40-50% more intensity, use less voltage and do not generate heat. Replacing a motorcycle’s OEM bulbs with LEDs can help increase the visibility of brake lights and turn signals. Check your tires and tire pressure regularly. Slightly underinflated tires can drastically reduce a rider’s ability to brake and corner and can spell disaster in wet conditions. – Always take along your tool kit! TAKE THE PLEDGE TO BE A SMART RIDER AND WIN UP TO $250! At a moment’s notice, things can change on the road. Riding a motorcycle requires extra concentration and judgment. Having a sense of adventure is great, but it’s no substitute for common sense! Be alert, aware and in control before you hop on your bike. 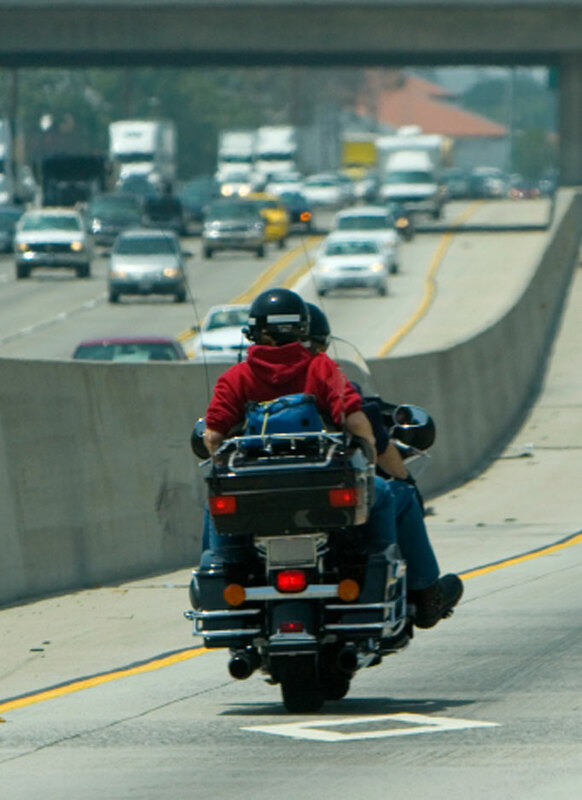 Traction becomes significantly reduced when riding a motorcycle during or just after a rain. Always make sure your PSI levels are kept at manufacturer specifications. Vehicles deposit oil, brake fluid, fuel and other residues on the road over time. When the rain commences, fluid residues and deposits are lifted and create slick areas on the road. Traction in these areas at the beginning of a rain shower can be similar to encountering a sheet of black ice. 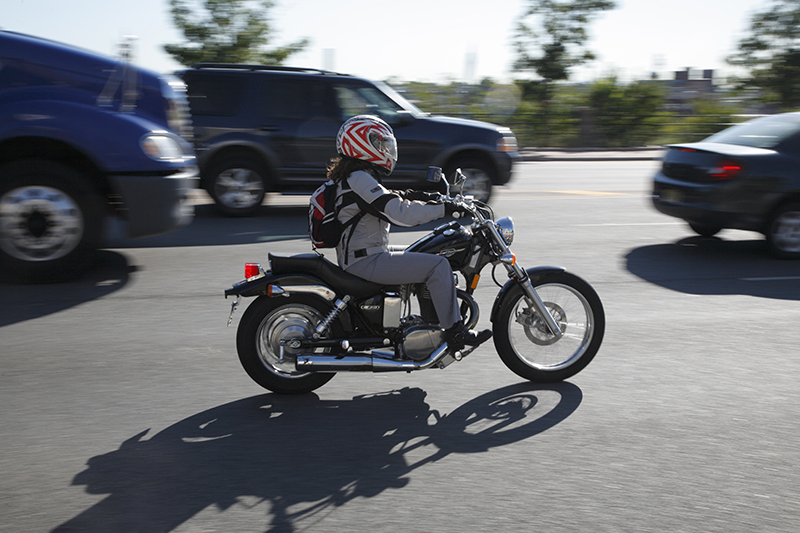 Most crashes between a motorcycle and a car happen at intersections, invading your right of way. Check for traffic coming from both sides. ALWAYS look in your mirrors, use your signal and look over your shoulder. Road conditions can change in an instant – whether there’s rain, snow, oil or an over-sized pothole, 100 percent of a rider’s concentration is needed. Judging distances, speed and braking are just a few of things that must be done quickly to avoid a potential crash. Riders need to pay attention to what traffic is doing ahead of them at all times. Passengers add extra weight, which affects handling. Adjust the suspension and tire pressure to compensate. Remember, the more weight on the motorcycle, the longer it may take to stop. Remember, laws are designed to keep everyone safe. Obey speed limits, traffic rules and make sure you follow at a safe distance. Refrain from aggressive and dangerous ridding that puts you and others on the road in jeopardy. 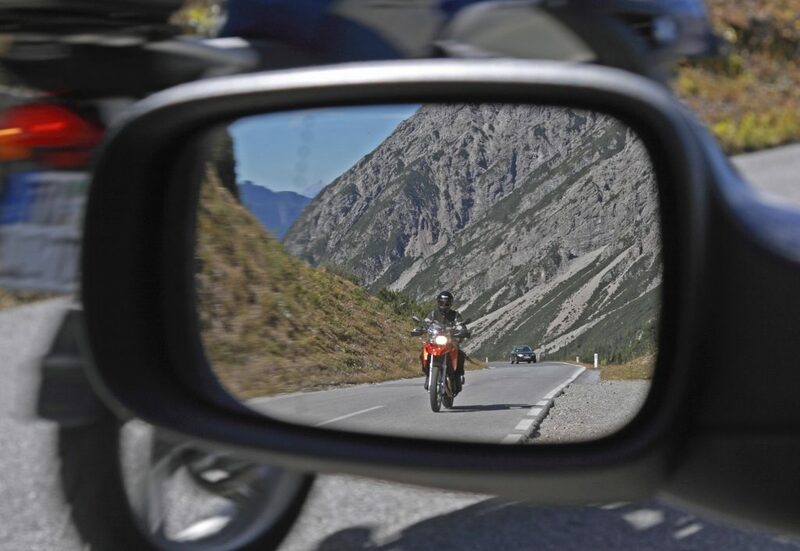 For large groups of 5 or more: 1) Break off in smaller groups, 2) Ride in a staggered formation – NOT side by side, 3) Keep at least a two-second following distance from the motorcycle in front of you, and 4) Pass other vehicles individually, when safe – not in pairs or groups. Alcohol or other drugs slows your reaction time and impairs your judgement – increasing the chance of a crash by 5 times. Over-the-counter, prescription, or illegal drugs may have side effects that increase the risks as well. Professional training courses are the best way to prepare riders for challenges on the road. Rider training courses are available at all learning levels through the Motorcycle Safety Foundation (MSF). Many insurance carriers offer a discount for completing a certified training course every 2-3 years. Contact your carrier for details. Basic Rider 2 (BRC2) (formerly the ERC) – The BRC2 will enhance your mental and physical skills and enable you to better respond to unexpected road and traffic situations. You may be eligible for a two-point reduction from your driving record and a defensive driving course credit from your insurance company (check with your insurance carrier). Advance Rider Course (ARC) – A one-day course that complements a rider’s basic skills and helps with personal risk assessment. The course is beneficial for riders on any type of street motorcycle. Street Rider Course 1 (SRC1) – For newly licensed riders, it is designed to be the first street riding experience under the supervision and guidance of a Rider Coach. The program includes classroom activities to improve perception, and has practice time on basic riding skills. Street Rider Course 2 (SRC2) – Enhances the basic skills and strategies that are provided in SRC1, and adds time/mileage to the on-cycle experiences in a local area. This program is for riders who wish to delve deeper into the perceptual strategies of street riding. All applicants for a motorcycle permit who are UNDER 18 are required to complete a motorcycle safety education course. 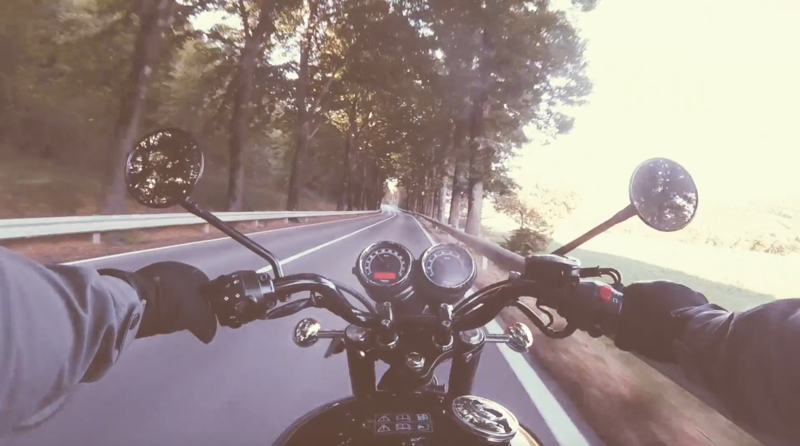 Motorcycle Safety Foundation – The Motorcycle Safety Foundation (MSF) is a not-for-profit organization that is a developer of internationally recognized motorcycle rider education and training curricula. 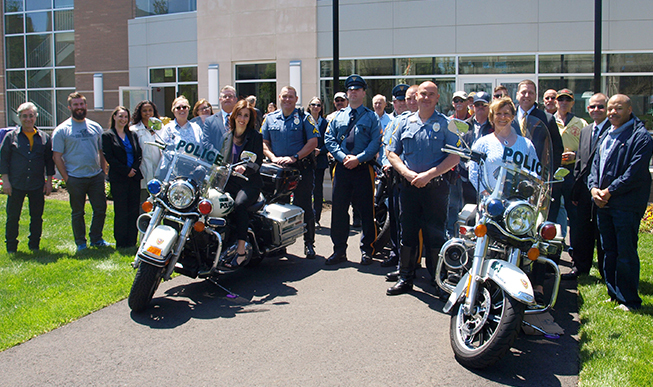 New Jersey Division of Highway Traffic Safety – NJDHTS provides general motorcycle safety facts, tips and resources. National Highway Traffic Safety Administration – The National Highway Traffic Safety Administration (NHTSA), implements safety programs, sets safety performance standard and conducts research. State of New Jersey Motor Vehicle Commission – NJ MVC promotes motor vehicle safety by delivering secure, effective and professional motor vehicle services. Brain Injury Alliance of New Jersey (BIANJ) provides information about how to prevent a brain injury and resources and support for people affected by brain injury” and also please alphabetize the resources.